It’s Frank’s birthday! Yay! Ok, it was his birthday a week ago, but we are celebrating tonight with a feast of beer can chicken and other things which I can’t remember at the moment. What’s for dessert you ask? 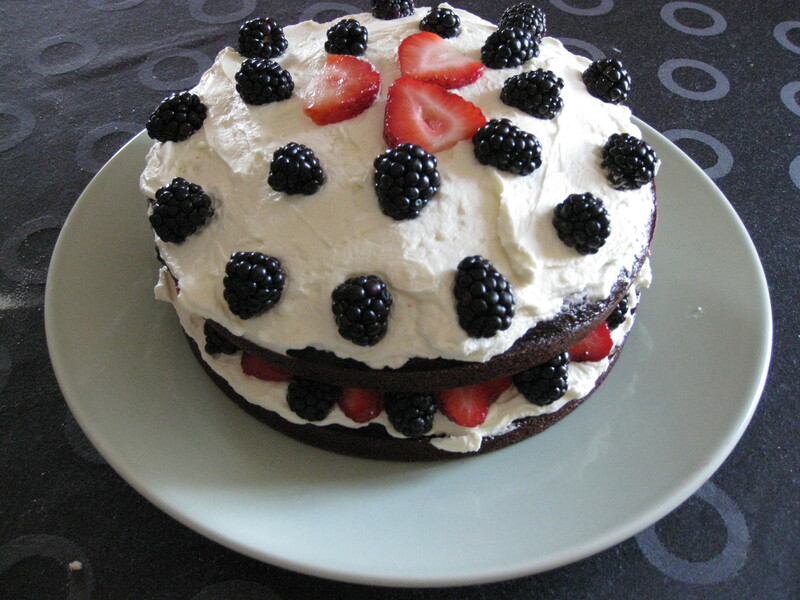 Chocolate cake with mascarpone icing, topped with some berries. Frank is a man who loves dessert, and I hope this cake doesn’t disappoint. The chocolate cake is one that I’ve made a few times now, and it is always great. It’s a moist, rich cake, that is very easy to make. I’ve seen the recipe in a couple of places now, so I’m not sure who to credit. Anna Olson has a version on the Food Network Canada site, and Epicurious also has a very similar recipe. The ingredients are the same, only the size of the pan and baking times change. The original recipes call for buttermilk, which I almost never have on hand so I used a combination of milk and plain yogurt. The cakes bake up pretty domed, and I didn’t trim the tops to level either one of them. When I was done icing the cake I realized the cake was quite lopsided. I’m going with the theory that its whats on the inside that counts. Combine dry ingredients (including sugar) in a medium bowl. In another bowl, beat coffee, buttermilk, vegetable oil, eggs, and vanilla together. Add the dry ingredients to the wet in 3 batches, mix until well combined. Pour into two 9 in pans, bake for 20 to 25 minutes, or until a tester comes out clean. Add 1/4 cup of the whipping cream and 1 tbsp of icing sugar to the mascarpone. Beat until the mascarpone is smooth. Combine the remaining cream and icing sugar and whip until firm. Fold the whipped cream into the mascarpone. Once the cakes have cooled completely, spread half the icing on one cake. Top with some fruits. Place other cake on top, and spread the remaining cream on that cake. Top with more fruit. Next > Do you know the Muffin Man?